If you are cycling, feel free to secure your bicycle to any post you can find or utilize the bicycle racks in front of our building. Visit the Active Transportation Alliance to find your safest, smoothest route. If you are driving, exit at Diversey or Belmont Avenues from 90/94 (and proceed Eastward) or exit at Belmont from Lake Shore Drive (and proceed Westward). Find metered street parking available with ease near the building. Inner Architecture is committed to earth-friendly and human-friendly practice. To every extent in our power, our quarters are free of chemical cleaners. All sheets we safely launder with nontoxic, biodegradable, and fragrance-free detergent. In our treatment rooms we cultivate an earthy elegance that supports your well-being and the planet’s. We select materials with sustainability in mind and we keep to these principles whenever ordering products or enhancing decor. 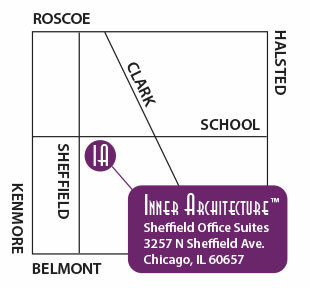 Inner Architecture is a carbon-neutral practice. Our bodies – our first and most immediate environment – cannot thrive, nor even survive, without vital inputs from their surrounding environment. As CarbonFree partners, we seek to do our small part to ensure that our work has a context. We invite you to visit Carbon Fund to explore how your household or business to become carbon-neutral too!